Day: Saturday, September 19, 2015 NOTE: this event has already happened, find current-year events on the events page. Plug-In North Central Washington’s kiosk, tent, and EV displays anchored one end of a 3 block stretch of exhibits for the Wenatchee Downtown Association’s annual Taste of Harvest celebration in the city's historic district. Pleasant weather and a lively buzz helped us to interact with over 300 diverse attendees including political candidates, policemen, families, retirees, tourists, teenagers, local team mascot, and face-painted children. 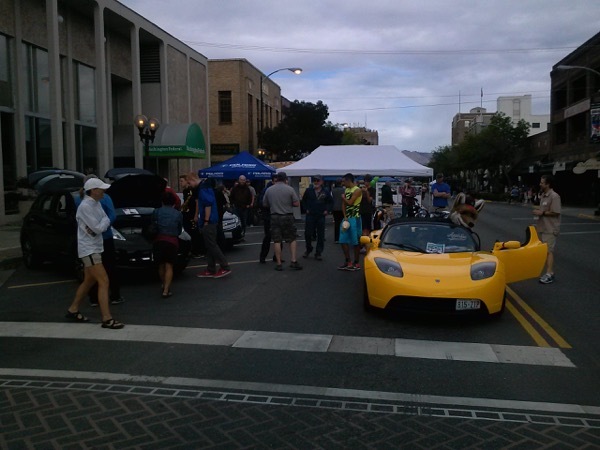 Our exhibits featured a Tesla Roadster, Volt, three Leafs, two Zero motorcycles, Polaris electric bicycles, and an array of battery powered 56-volt yard maintenance tools (chain saw, weed whacker, leaf blower, hedge trimmer). We also had a portable Clipper Creek charger available for hands-on demos. EV grins were bountiful during the demo rides, and there was never a moment when the exhibit was without at least a half-dozen folks inquiring about available and future EVs. A beautiful day that resulted in more EV converts. Plug-In North Central Washington is excited to announce that Wenatchee will be one of the world forums for National Drive Electric Week in 2015. Our activities will be integrated with the Wenatchee Taste of the Harvest Festival set for Saturday the 19th of September. Displays of electric powered equipment, cars, motorcycles and utility vehicles are planed. One very popular feature from the 2014 EVent will be continued too. Participating EV drivers will give rides and even in some instances allow others to drive their cars. Registered attendees report 97,600 electric miles driven.